I have a whole bunch of new polishes that I "should" be wearing and posting about right now. But I keep reaching for whatever I feel like wearing instead. I'll get to the new things soon enough, but for today, I'm sporting a combo that is making my life better just by wearing it. I was wearing Zoya Mitzi from the Mod Mattes collection (see here for full review) yesterday because I only had time for a matte polish. This is why I love mattes, they prevent me from leaving the house unpolished. I really love the acid green matte color, so this morning I decided to just add a little something instead of removing Mitzi. 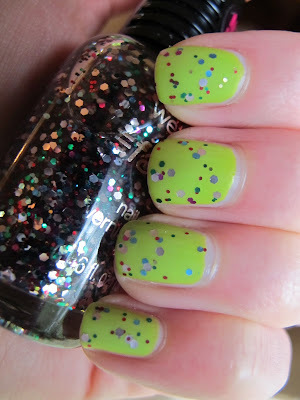 I had yet to wear Wet and Wild Party of Five Glitters as a full mani, so I decided to add two coats of that little gem. Then, to top it all off, I added one layer of matte top coat (Knockout Cosmetics Flatte Top). I LOOOOVVVE the way this looks. My mom commented "It's like confetti", which is very true. 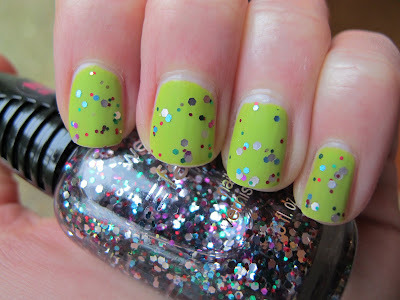 I really love the lime green with all the different glitter colors, especially the baby blue glitter pieces. I'll definitely be wearing this combo again. All pictures show two coats of Zoya Mitzi, two coats of Wet and Wild Party of Five Glitters, and one coat of Knockout Cosmetics Flatte Top. Zoya Mitzi was sent to me by a PR agent for Zoya. For more information, please see my Disclosure Policy. Zoya Mitzi is available online at Zoya, Wet and Wild Party of Five Glitters is available at a drugstore near you, and Knockout Cosmetics Flatte Top is available at Knockout Cosmetics. 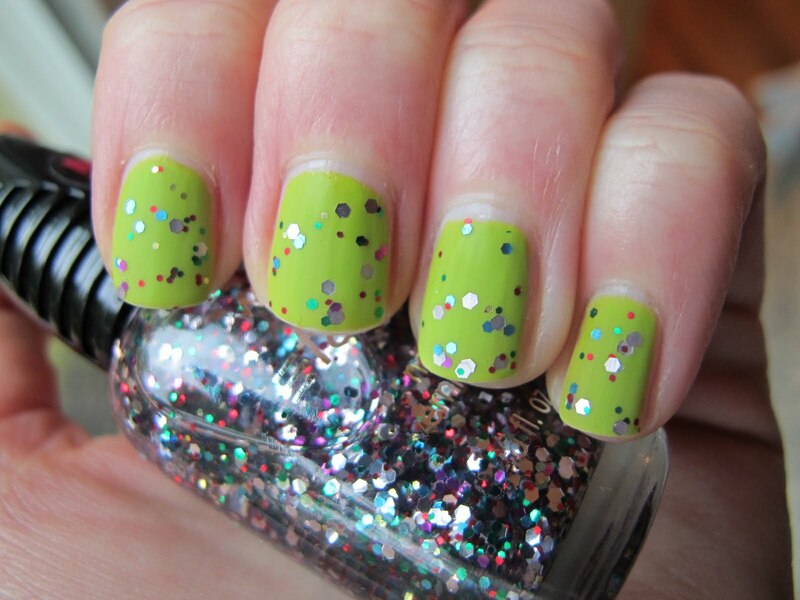 This totally looks like a party on your nails! Thanks Deborah! It's making my Monday better! I can't wait to try my Zoya Mitzi and Phoebe! I'm not much of a Matte wearer, but I love how blindingly neon Mitzi is! Looking forward to swatching it myself later this week! I'm loving the glitter over it as well, just gives it a little something more! Definitely try it Melissa, I've been staring at it all day! Nana- thanks for reading, I would recommend trying this with any mattes and glitters! Lacquered Lover- I'm really enjoying all of the Zoya Modmattes! They're so bright and summery! Natalie- I bet it would look just as cute! I had that thought myself! Let me know how it turns out! I finally last night swatched and posted about Zoya Phoebe! Your post on Mitzi inspired me! I'm thinking a french with the two would be gorgeous and bright for summer!